I finished writing and revising “Dead and Gone,” and I sent the essay off to editors of a journal who asked to see more of my work. One editor e-mailed me back today, confirming its receipt. All I can do now is wait. A few readers and friends have asked about the incident central to the essay: a meeting between my Wellesley College professor and me. That scene, which is the last bit from the essay I’ll post, is at the center of the story. It’s what I most recall about the professor and our acquaintance, and it’s what I have turned over and over in my mind as I have considered my college years (1983 – 1987) and what the encounter has meant to me. Note: I have given the professor a pseudonym. One day, back in the spring of 1986, I visited Professor Zimmer in his office. We sat, in wooden chairs, facing each other. There was no desk between us. Behind me, the door. Behind him was a window to the steps of Founders Hall, rhododendron masses, and Severance Green. In the room there must have also been bookshelves, and perhaps an ink drawing tacked to the white-painted plaster wall. It was beyond winter. Whether I arrived at his office in a coat or not, I was no longer wearing it. I had on my best shirt, yellow broadcloth with a small foulard print, worn buttoned, tails out. There was a certain uniform that we wore then, to show that we were serious young women. Looking back, my friend Marcia called it the Chinese Worker Party Look: khakis, the untucked shirt, often oxford blue, the flat shoes worn without socks — a genderless uniform for future intellectuals. Still, my hair was gendered: I wore it shoulder length, dark brown and straight. In college I still wore contact lenses, and my eyes and hair I knew were good features: shiny hair, big eyes. In his sunny room, I could see dust floating in a stripe of light between us. He wore pullover sweaters all the time, so I’m sure he had one on this time, too. His wire frame glasses were gilt circles on his face, and he wore khaki or corduroy pants that were not unlike mine. His body was clothed, yet near. Could I smell him? Maybe his office just smelled good, filled with its mix of wood and paper and wool and cotton and the iron of the heated radiator. In his hands he held white paper. “Are you a history major?” he might have asked. I don’t remember how the meeting began. “English major, plus German Studies,” I answered. “Because you’re really good at this. You could be a history major.” He smiled. “Well, I am interested.” In you, I could have added, but of course I would not have said that. I felt dishonest. Yes, I’d kept my eyes on him, but I was not always paying attention. “Uh, thank you,” was all I could think to say. I hoped he wouldn’t start to quiz me on what I’d absorbed in all the moments I’d been gazing at him. My recall of facts would have been uneven. “And this paper! It’s so good. You have a natural talent for writing history,” he added, exuberant. My paper was giving him pleasure, as if I had bought him a present, and it turned out to be exactly what he wanted. I didn’t know what to say. I didn’t even know what it meant to be a good writer of history. How could I take credit for it? I smiled modestly. His eyes twinkled, as though we were conspirators. “It’s okay to switch majors. Other students do.” He leaned forward a few degrees. His bent knees were closer to my bent knees: Did they brush? My feet were planted on the floor. I held my legs very, very still, and I willed myself to be like a rock: solidified, petrified. Why were we suddenly so close? A second passed, or two. The room was still, my body pinned in the chair and in space. Without moving my eyes, I watched the dust sparkle again in the air between us, and I looked at him and I did not look away. This was a test, and I wanted to pass it. The office was his, and the silence was his to disrupt. “You know, if you ever want to talk about your major, or the class, we could meet again. In the afternoon, or later. We could even go get a beer.” There was a pause. “Sometimes I’m free in the evening.” And he looked at me without looking away. I felt as though I was being dared: dared to be the object of attention, dared to interpret his offer, dared to say, Yes, I’d love to. I sat there, pinned and thinking. And the big billboard of my romantic fantasy gave way and fell into pieces. I saw us meeting in the parking lot near the town grocery store after dark, and him pulling up in the kind of old Volvo that all the professors drove and flinging open the passenger side door and me getting in, and me ducking down below the dash so nobody could see me as we drove and drove and drove away from town to somewhere he would take us. And on the floor of this car I saw all the crap that’s always on the floor of these cars, because as a babysitter for other professors and their children I had driven these cars and ferried children not my own around town in them, and I recognized the bits of cereal and plastic lunch baggies and receipts and the discarded envelopes of mail opened in the car and the gloves and winter grit and the floor mats askew. And I had plenty of time to study this stuff on the floor because my head was tucked down, and there was no view out the window for me, because I was hiding — he was hiding me – and this, I suddenly saw, is how our time together outside of school would be. “Thank you,” was all I could say out loud. I had no words for whether I would consider history or not, meeting or not, because suddenly I knew that all I wanted was to remove myself from what would only, it seemed then, become sordid. Old car, old motel room in some other town, old dirt. And I stood up and he stood up. “Think about it,” he said; the moment, to him, was still open. I smiled, to be polite, and because I had loved him and surely it was right to honor that, and I went out the door, back into the hallway, and then out onto the steps and into the sunny afternoon. Stunned, not quite sure of the meaning of what had happened, I walked back to my dormitory on the paved path that skirts the green, where it was almost time to go down to the kitchen and eat dinner with whomever of my girlfriends was then around. 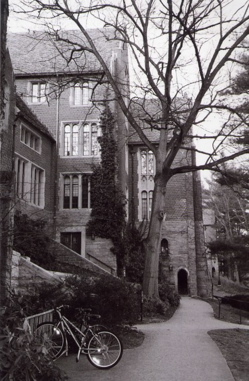 The black and white image of Founders Hall is from the Wellesley College Class of 2006 newsletter. There are also some great photos of the college by Julie Woo on Flickr, and I would have loved to include one, but hers are copyrighted. Can I read a hardcopy? Thank you for sharing this. You capture the awkwardness of the meeting so well. Also, you tell a story that I don’t think is told very often. My comment sounds much more distanced than I felt when I was reading the piece. The images you create in the fourth-to-last paragraph are vivid, and make me as a reader envision your vision of what would have happened. Well done.